#1416 RP High School Anacortes WA !!! #721 Pair WA Hurricane Disaster Postcards! These rppc postcards are nice! Both are original RPPC postcard views. The first pictures an old wooden building with debris everywhere. At left is a large boat? A sign out front reads "Seattle Lobster House". Back of card is handwritten and reads "Long Wharf, Walter Cremin, a bartender, was killed in the wreckage of the Seattle Lobster House, hurricane of Sept. 21/38". The second card pictures a large uprooted tree. 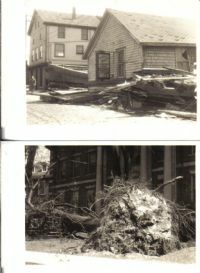 Back of card is handwritten and reads "Once a beautiful elm tree opposite the Court House, blown down in hurricane of Sept. 21 1938". Both nice collectible RP disaster related postcard views! Back of both cards are undivided and postally unused, with an "A Z O Place Stamp Here" stamp boxe. Condition is excellent to near mint on both! Any lines or waves are from the scanner and not on the actual image.